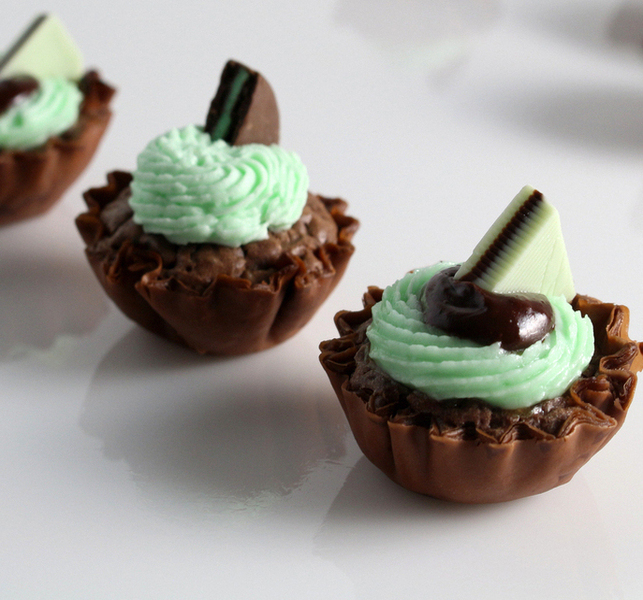 Bursting with fudge brownie filling and topped with cool crème de menthe frosting, these brownie bites are sure to become a fast favorite. Preheat oven to 350°F. In a medium bowl, mix together brownie mix, eggs, water and oil until smooth. 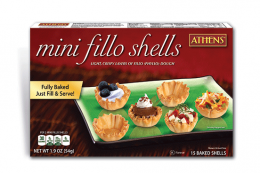 Spoon mixture into each phyllo shell ¾ full. Place on baking sheet and bake for 15 minutes. Set aside to cool. In a small bowl, beat confectioners sugar, 1 stick butter and crème de menthe for 3 minutes or until fluffy. In a metal bowl over simmering water, melt chocolate and remaining butter stirring gently until combined and smooth. Allow chocolate to cool. Pipe or spoon crème de menthe mixture onto each brownie bite. Top as desired with cooled chocolate and cookie/candy pieces. 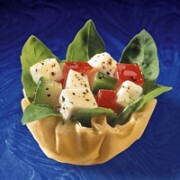 This meatless appetizer puts the top elements of a flavorful summer salad in a crispy Mini Phyllo Shell.